Flower color pink or purple and in round bowl shape and five petals. Fruit color is white-green the peel pink color. Chilling hours or cool winter (depend on the cultivars), if the tree attack in the beginning of the winter need to collect all the leaves and the fruit from the ground, cut all the infected branches. 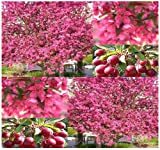 Is it necessary to graft in Malus prairie fire? What can be done with big quantities of Malus prairie fire fruits?